The search for the next costume is on. Since Henry turned two, Halloween has become one of my favorite holidays. It's that time of the year when I can turn him into something scary. 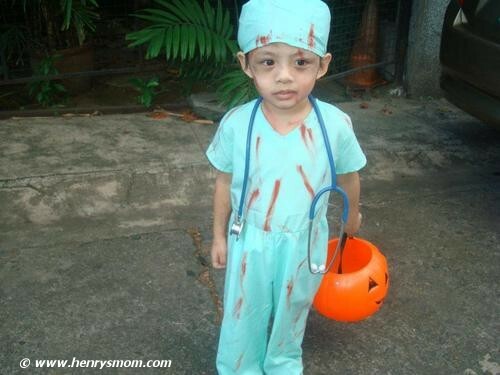 See, I wanted to do away with the usual kiddie costumes, i.e. super heroes, animals, cartoon characters. It's a given, all kids are cute, so I didn't find it a challenge to make them even cuter with these costumes. But turning a cute kid into something scary, now that's a challenge. 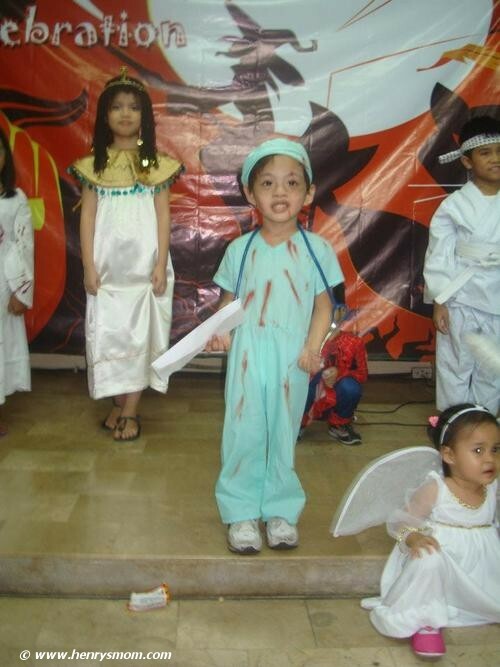 Henry's first Halloween party was at preschool when he was two. 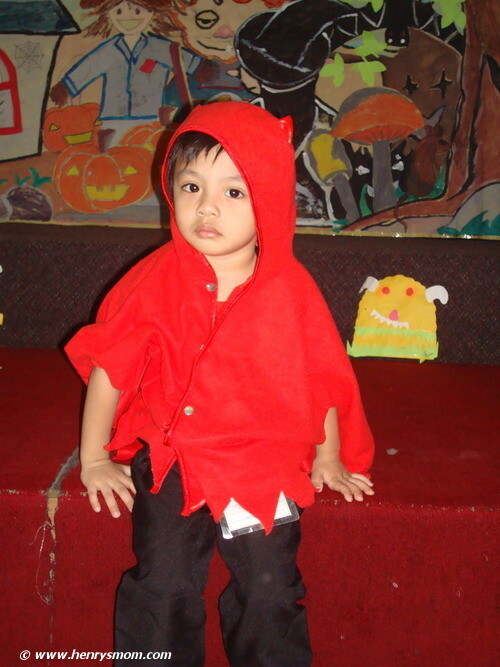 Since this one was at preschool, I just turned him into a little devil. 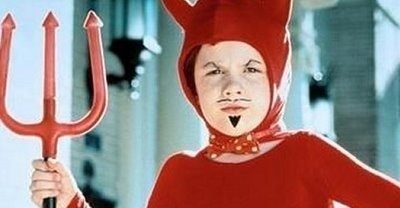 I know he wasn't at all scary in this but all I could think of when I got this was Junior from Problem Child. Now who wouldn't be scared to have a child like him? 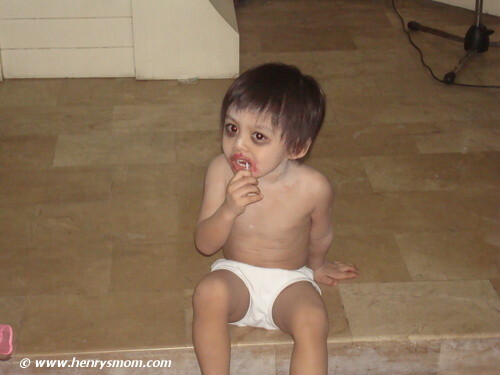 Yep, I turned my son into Toshio. And, the only things that I needed were baby powder, lipstick and eye shadow. Most of the small kids,and some of the big ones, got scared of him. He almost won the scariest costume that year. He was the 2nd placer. Last year, everyone was talking about The Walking Dead. So, I turned him into a zombie doctor. Again, baby powder and lipstick did the trick. The scrubs were pasalubong (gift) from the States. His dad was one of the judges for best costume that year, so obviously, he didn't get to win. But he did end up in 2nd place again. Hopefully, we get to pull one of these off. And, maybe finally win best costume this year. What do you think? Do you have any suggestions? To get kids scared of another kid is something lol! Tipid na sa costume, effective pa. Didn't he feel cold wearing just underpants? I can't decide between Joker and Chuckie...good choices though. Hi! di naman sya nilamig. the weather was just right that time. Di tulad ngayon. Sis, Joker is my vote. I think you only need powder or foundation, lipstick, eyeshadow and gel for his hair. Si Chucky Doll for me! So scary! Yay! Cute kid! :) try chucky! wooooh! totally scary! 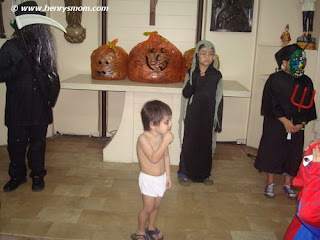 we used to go to ayala alabang for trick or treat and my kids really love the candies which lasted for one month! The toshio get up is so cute. Haha. Id go for joker too , show us the pics when you do! Thank you. ao glad I've helped in a way. Hahaha! If being scary is part of the criteria for judging then go the scary Chucky but if for just fun go for the Joker. Have you finally decided? Would love to see it! For the past 8 or so years we have been having our very own Halloween party here at the compound for my nephews and nieces. I didn't prepare for one this year though, because most of them are already grown up and in highschool, college even! But they are asking for it so maybe we'll still have one. 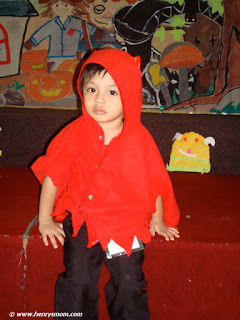 Hope my little nephew can come over for that night and wear something cute or scary.